It's December 1st & I'm officially starting the Christmas season in our household. Though, truth be told, we've already been to several Christmas events like the East Van Panto, a couple of Holiday parties, & visiting Santa. I love doing a Christmas countdown with the kids, & Oliver grew up with the tradition of the Advent calendar, so we're continuing the tradition in our own way. This year is a combination of things we've done in the past. Using the giant tree-shaped felt board with a set of numbered felt ornaments that I made a few years ago, plus some small gift bags I got at Ikea, we're doing an activities countdown calendar. I made up a list of holiday-themed special events & simple activities to do with the family, then created a set of cards with clipart images to go with each. 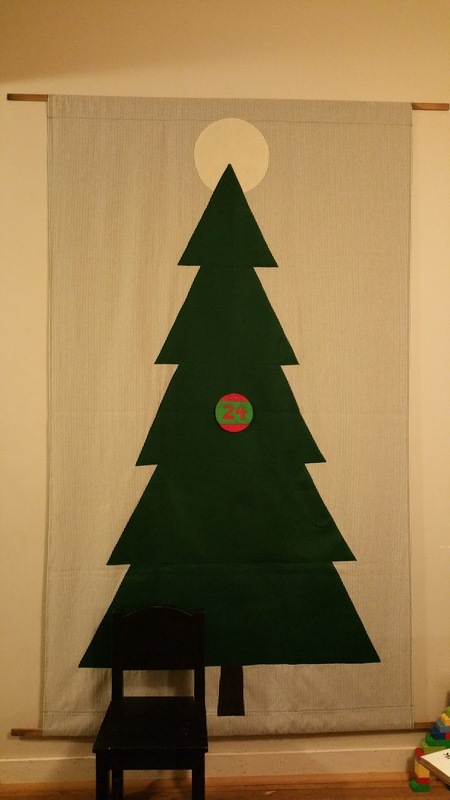 Each day, the kids will get to take the number off the calendar, put it on the felt board tree, & read what the special activity is for the day. 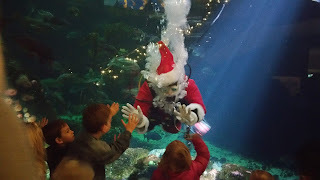 Some days it's extra special outings, like today, when we biked over to the Vancouver Aquarium to see all the critters, plus Scuba Claus & Rudolph 4D. Other days it's going to be easy things at home, like making paper snowflakes. While this whole activities calendar thing seems like a lot of work, it's actually very affordable & great for slacker parents--hear me out! There was a bit of prep getting the bags & hanging them up (I used rick-rack & mini clothespegs to attach them) but you can easily use envelopes, brown lunch bags, paper clips, regular clothes pegs--whatever you've got around, or can find in a quick trip to the dollar or grocery store. The secret here is that you don't need to plan out the entire month in advance. As long as the bags/envelopes are opaque, the kids won't know that you're deciding the night before what the activities are going to be. You could even print or hand write them as you go. There are some great variations on this too--one of my Facebook friends is doing fitness activities with her family each day, & Jen of Mama.Papa.Bubba has a sweet Kindness Calendar version (with free printables). & if you want to go the more usual route with chocolate--it's easy to pop one or two of those in the bags as well. 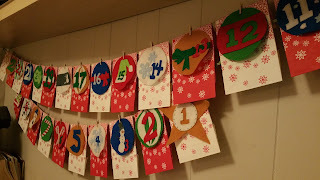 Have you done a countdown calendar like this? How did you do yours? Let me know in the comments!